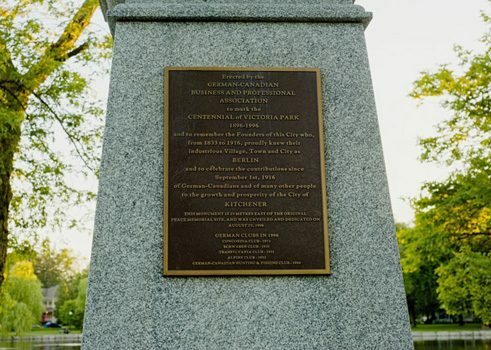 Plaque of the "Peace Memorial"
From its founding, Kitchener-Waterloo has had ties to German and Germany. In fact, the city now called Kitchener used to be called Berlin. Its earliest settlers were Mennonites originally of Germanic and Dutch origin, and the existence of a German-speaking community attracted new immigrants directly from Germany. When a railway was run through the town in the mid-19th century, the industrialization it generated helped to bring more people to the area. Although the Mennonites and the German immigrants spoke different dialects, they were able to understand each other, and German was the dominant language in Berlin as late as the 1870s. From that point, immigration from Germany started to slow down, but it was still considered predominantly German across Canada. This led to some tension in Berlin during the First World War. The Mennonites are an Anabaptist peace church who traditionally opposes military service, so they did not enlist when the war started. This refusal to fight coupled with the large population with German heritage meant that many Canadians assumed the inhabitants of Berlin to be disloyal. Distrust and anti-German sentiment directed at the city grew. One of the instances of this unrest happened in 1914. The city of Berlin had purchased a bust of the German Kaiser Wilhelm I in 1897 as part of a memorial celebrating peace in Europe. This bust sat on top of a pedestal called the Peace Memorial (or “Friedensdenkmal”) in Victoria Park in downtown Berlin. 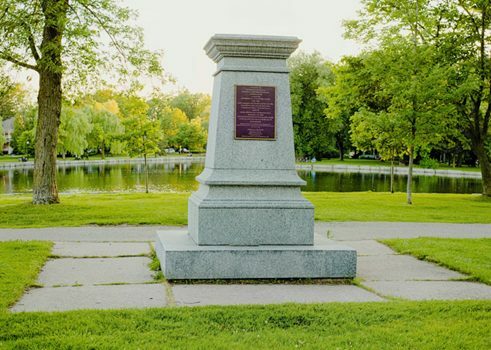 On the morning of Sunday, August 23rd, 1914, locals woke up to find that the bust had been tossed in the nearby Victoria Park Lake. After being fished out of the lake, it was given to the Concordia Club, a German society in Berlin, for safekeeping. However, two years later the bust was stolen from the Concordia Club by soldiers and members of the public. It was paraded around and used for target practice, while the Peace Memorial was vandalised. The bust of Kaiser Wilhelm then went missing, and the park board ordered the Peace Memorial demolished. In September of the same year, the city changed its name from Berlin to Kitchener. The name has remained Kitchener since then, after the British minister of war, however anti-German sentiment is no longer a factor. The city is no longer as strongly German as it once was, but it still celebrates its German heritage with occasions like Oktoberfest. In fact, the German-Canadian Business and Professional Association rebuilt the Peace Memorial in 1996 with the approval of the city. It now sits in Victoria Park with a plaque telling the story of the bust, and without the bust itself.